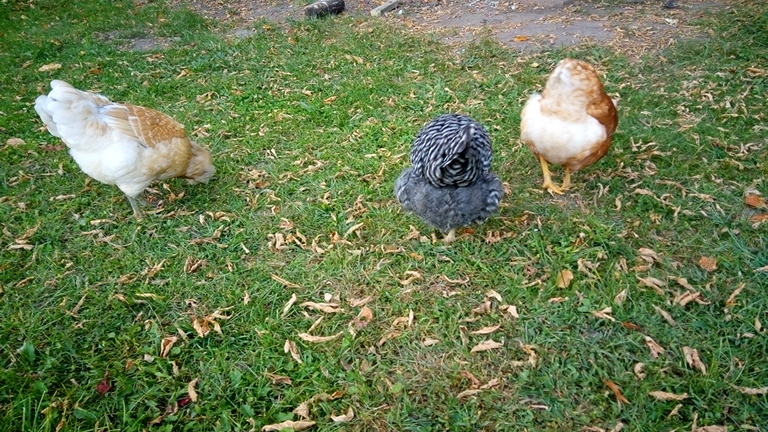 Love those fluffy chicken butts! let me just get this out of the way right now. As you know, if you have googled such a thing, the usual, and perhaps only, answer out there is: a little while. Every hen is different. Just be patient. The girls are working out the kinks in their egg-laying systems. Ha. Easy for them to say, when we are waiting on pins and needles for those perfect eggs. Here's my answer. My hen (and I'm not sure whether it was the cinnamon queen or the barred rock--I used to think it was the cinnamon queen, but now I'm leaning toward the rock, based on other clues that have come to light), laid rubber/shell-less/thin shelled eggs every day, sometimes multiple per day, for 9 days, then started laying regular hard-shelled eggs. Again, every hen is different, but perhaps that will give you a little peace of mind in the midst of what seems like a never-ending string of weird rubber-like eggs. I need to be straight with you here and let you know that during that string of weird eggs, the temperature was warmer than usual, which might have been a contributing factor in the longevity of the rubber egg run. But there it is. Nine days, and probably 20 eggs. I'm pretty sure we didn't even find all of them. All right, so, back to the update, for those of you who are not compulsively googling about thin-shelled eggs (those of you who are, are welcome to stay for the update, too). The girls have been with us for 20 weeks, which is about 4 1/2 months. We've been getting 1 or 2 cute little eggs a day pretty consistently for about a week, which is fun. It's a little like a treasure hunt. I mean, when you have 2 dozen laying hens, pretty much anytime you decide to go check the nest boxes, you're going to find eggs, but not when you only have two. A lot of people assume that chickens lay their eggs at the same time every day, but that's not true. It takes more than 24 hours for an egg to form, so the girls lay the eggs more than 24 hours apart. We haven't quite figured out the girls' laying schedule yet, so we just go when the mood strikes us, and sometimes we find an egg or two. Speaking of having two laying hens, on Sunday morning, we found another two shell-less eggs. So it's possible Esther is getting close to laying, or it's possible that Rocky succumbed to the heat and wasn't able to keep those eggs in long enough for the shells to deposit (one was perfect except for the lack of shell; the other was pretty much a yolk in a membrane. We know it wasn't Toasty Crunch, because she laid an egg later in the day, and there's no way she would have had time to form a third, perfect egg in that amount of time). My gracious, y'all. It was so hot. And those poor chickens are wearing down coats. It's ok if it gets hot during the summer, 'cause they're acclimmated to it, but this time of year? Nope. Not a good situation. I helped the girls cool down a little bit using a three pronged aproach. First, I gave them strawberries frozen in water, to cool them from the inside out. Second, I put ice in their waterer. Third, I made a little icewater bath that they could stand in, if they chose. I don't think it helped a whole lot, but they did seem to appreciate my efforts. And now, it's cool again, and we're all much happier and less pant-y. And now for the Toasty Crunch show (she was exceptionally photogenic these past two weeks, I guess)! This was the best I could do between the uncooperative chicken and the boy who kept making weird expressions. Dust bathing. Look how fluffy! For those of you who are wondering, yes, I am still buying eggs, although I only bought one dozen yesterday, rather than my usual 2 or 3. Like I said, we've been getting one or two eggs a day, and I'd estimate they add up to about a dozen a week. 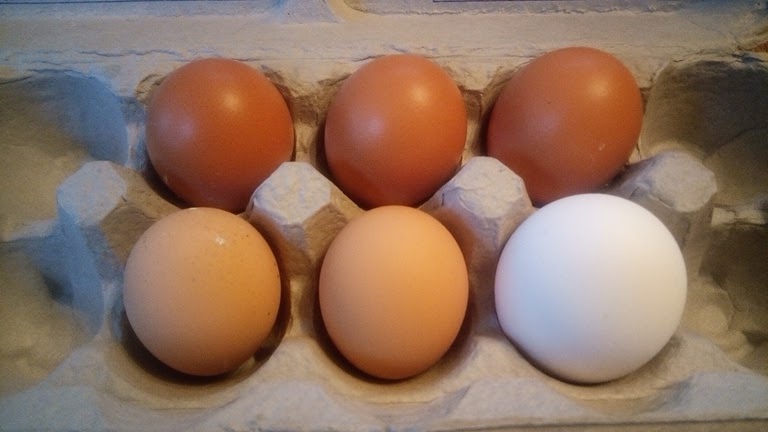 The eggs we're getting from our girls are about half size, which is actually kind of nice--there have been many times when I've wanted half an egg for various reasons--now I've got some.